Just prior to leaving Ottawa, I picked up three new books from Chapters, one of which being A History of Bangladesh, by Willem van Schendel. The book is written with pleasant, very approachable prose uncharacteristic of most non-fiction books. Therefore, not surprisingly, I finished it quickly. It was an excellent book. One of the most important aspects of this book was the degree to which the author's own views were inserted at every corner. 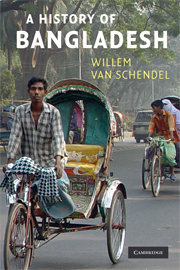 Ordinarily, I would count such editorializing against the book, but in this case, van Schendel has come to some of the same conclusions about the country of Bangladesh that I have myself. Nonetheless, I had a great deal to learn about the Bengali delta, its people, and its culture, and van Schendel's book provides a fascinating look into the little-understood early history of the region. According to van Schendel, ancient Bengal ("ancient" is my word, not the author's - we're talking about the period corresponding to the ancient Greek and Roman empires) was an important hub of economic activity. Its people produced an enormous and highly valued agricultural output, including cash crops before such things were understood as "cash crops," and also legendary textiles. More importantly, however, the Bengali delta was a crossroads of trade, providing a bridge between the European, Persian, and Indian kingdoms of the West and the Far East kingdoms of the East. Situated right on the coast, immediately between the two most active trade regions of the globe at that time, the Bengali people may have been the world's original "merchant class," or at least such is the picture painted by van Schendel. What fascinates me most about this picture is that it seems to lend a window into the modern history of the people of Bangladesh. Like all regions of the world, the merchant class is always scoffed-at and hated by would-be rulers. Van Schendel indicates that even the earliest written descriptions of Bangladesh are highly critical and dismissive of its culture. My explanation is that emperors did as they do now: denigrate anyone they wish to own. And own Bangladesh they did. The Mughals, the Indians, the Dutch, the French, and the British... Empires the world over tried to harness the raw creative economic power of Bangladesh - tried and failed. The second component of van Schendel's picture of Bangladesh is his account of how every major empire throughout history has done its best to keep the people of Bangladesh under a boot heel while they, the would-be emperors, attempt to reap the riches of the region. This unfortunate historical fact is, according to van Schendel, the main reason why Bangladeshi poverty persists to this day. It is a country that was prevented from developing its agricultural technology by the reigning British who merely wished to produce large cash crops using cheap labor-intensive farming methods. It is a country that was prevented from developing its industrial technology by the Pakistani government's pursuit of foreign aid for "traditional" output. Again and again, van Schendel's Bangladesh has endured colonialism and political in-fighting among competing ruling minorities, to the detriment of the Bangladeshi people at large. But it is not all bad news. Perhaps the most important lesson van Schendel provides us with is the fact that, despite the worst kind of political catastrophes, the heart and soul of the Bangladeshi people remains true to itself, resilient and unconquerable.